The Fort Sill wastewater treatment plant in Lawton, Oklahoma has adopted a reuse system that replaces on-site potable water usage with high-quality wastewater effluent. The recycling distribution network gives Fort Sill the ability to use the treated wastewater in its energy plant's cooling towers and for geothermal heat pumps to condition buildings. "Under a typical water rate structure, a project of this type has the potential to save the utility between $200,000 and $300,000 a year," said Garver Treatment Plant Operations Specialist Michael Graves. "When recycled water leaves the treatment plant and picks up additional users, it becomes a new commodity while reducing potable water usage and costs." 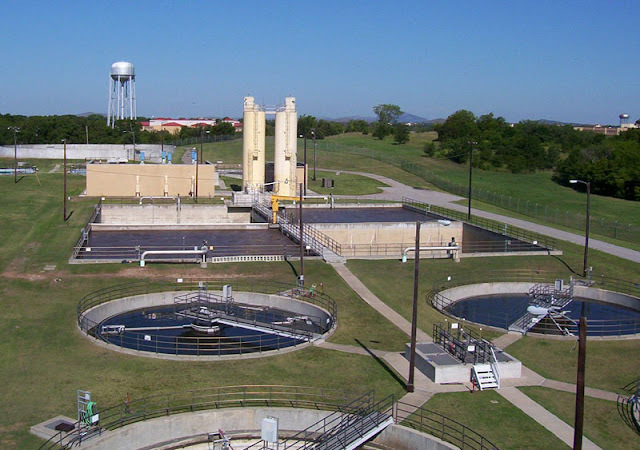 The Fort Sill wastewater treatment plant produces high-quality effluent. Its treatment process includes clarification, activated sludge, filtration and UV disinfection with re-aeration processes. To move the treated water around Fort Sill, Garver designed a recycling distribution network that includes a chlorination chemical treatment system, a pump station, and underground supply and return piping. "Clients can get a big bang for their buck when recycled water becomes a commodity," Graves said. "At Fort Sill, those potential users are the energy plant, other chilled water or cooling tower operations, and irrigation for event fields. In the future when additional phases are implemented, contractors could even access it for dust control during construction activities." Read more about this project in Garver's IQ newsletter article Wastewater Reuse: The New Commodity.